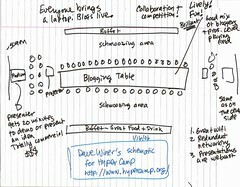 Now that I have a scanner I can share the diagram I've been drawing for people to explain the HyperCamp concept. The blogging table is HUGE. 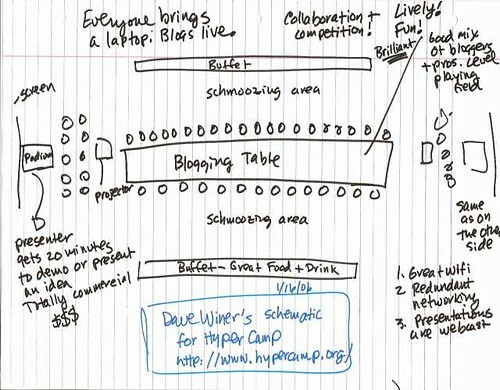 Room for up to 100 bloggers (and pros). At either end there are presentations. They might be boring, if so, no one is obligated to listen. Many of the presenters pay for the privilege. Some are given free slots because their ideas are so compelling. It's totally commercial, unlike an unconference. The idea is to put commerce together with the media. This is the press room for the 21st century.